Tempura is a well known Japanese dish made usually with shrimps or other seafoods like squid or fish and also vegetables. 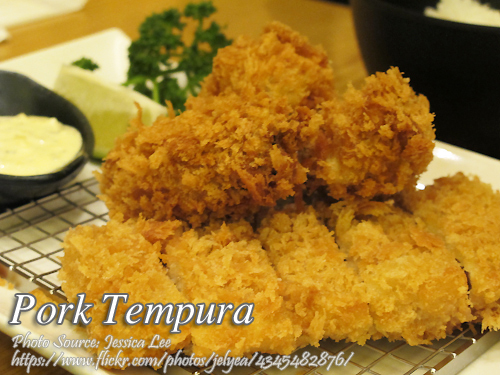 There are also other version of this tempura using chicken or pork. This time we are using pork as the main ingredient in making pork tempura. The pork part that are used should be tender and ideally you should use pork tenderloin but you can also use other part like the pork shoulder because it is usually available in the market. The process is also simple and we are not using the batter for coating the pork but some sort of a breading which is a combination of flour, bread crumbs and egg. Sorry folks if this recipe is confusing because making tempura should be coated with batter and not breading like this one. This is closely related to pork tonkatsu. But since it is simpler to cook it this way so I decided to post this recipe here. Anyway this recipe also includes tempura sauce which I’m sure you are going to love. Rub the pork with salt and pepper and set side. Combine flour and cornstarch in a bowl and mix. Heat oil in a pan for deep frying, about 2 cups. Dredge the pork in the flour/cornstarch mix individually and dip in the beaten egg. Roll in bread crumbs and deep fry until golden brown. Transfer to a wire rack or plate with paper towels to absorb excess oil. Serve with tempura sauce. Combine all the ingredients in a pan and simmer for 3 minutes. Cool and serve with pork tempura.